Light Industry presents two rarely-screened videos by artist and philosopher Adrian Piper. About half a decade later, Piper staged another collaborative experiment with related goals, but highly different means, based around the effects of one of Piper’s most well-known pieces, My Calling (Card) #1 (1986-1990). In this “reactive guerrilla performance,” as Piper outlines in her essay “My Calling (Cards) #1 and #2," “the situation is one in which I find myself in otherwise exclusively white company at a dinner or cocktail party, in which those present do not realize I am black” and “thinking themselves in sympathetic company, they (or any one of them) proceed to make racist remarks.” Her response to such a situation was to unceremoniously hand out a simple calling card containing a pre-written text, alerting her fellow guest to the fact that, despite what they may have presumed because of her light skin, she is in fact black. 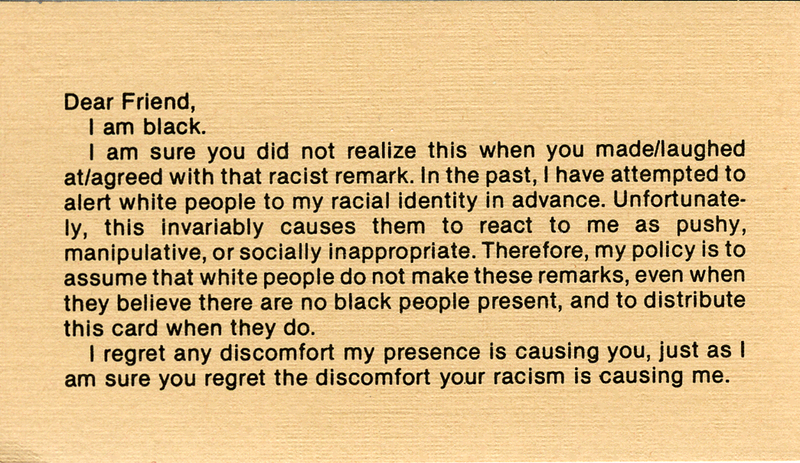 "I regret any discomfort my presence is causing you,” the card concludes, “just as I am sure you regret the discomfort your racism is causing me." Rather than documenting My Calling (Card) #1 directly—indeed, it would be essentially impossible to do so—Piper’s video My Calling (Card) #1 Double Meta-Performance presents footage of what Piper terms “meta-performances,” consisting of reactions to the concept of Piper’s piece. The earlier of two meta-performances on the tape took place at the Randolph Street Gallery in Chicago in 1987, in which My Calling (Card) #1 served as the subject of discussion. The second meta-performance, meanwhile, at the Studio Museum in Harlem, focused its conversations around the Randolph Street Gallery meta-performance, and in the final video footage of the Chicago meta-performance is edited into that of the Harlem meta-performance, functioning as a kind of extended flashback. The Chicago participants are all white, whereas the New York crowd is more diverse, but predominantly black; the differences between each group’s reactions become instructive. Above image: Adrian Piper, My Calling (Card) #1 (for Dinners and Cocktail Parties), 1986-1990. Performance prop: business card with printed text on cardboard. 3.5" x 2" (9,0 cm x 5,1 cm). Collection Adrian Piper Research Archive Foundation Berlin. © APRA Foundation Berlin.